>> Alissa D. Goodwin, M.D. Dr. Alissa Goodwin was born in beautiful, rural Whitefish, Montana. 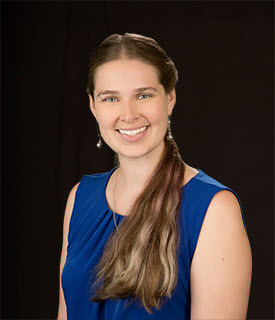 She originally studied accounting at the local community college but after realizing a love for counseling one-on-one with clients, moved to Missoula and attended the University of Montana. Combining a love of teaching, math and science led straight into medicine, and she gained an undergraduate degree in Cellular and Molecular Biology. She enjoyed attending medical school at the Oregon Health and Science University in Portland, Oregon, where she joined the Rural Scholars Program in order to stay connected to her roots. Her interests in medicine are in women’s health, international medicine and preventative care. She enjoys relaxing by dancing with her husband, working in the garden and knitting. The Patient Rating score is based on responses given during the CAHPS Patient Experience Survey.Responses are measured on a 10 - point scale, with 10 being the best score. These scores are then translated to a 5 - point scale in order to display results in a 5 - star rating.Comments are also gathered from the same survey and displayed in their entirety with the exception of any language that may be considered slander, libel or contain private health information, which will be removed prior to publishing the comments. I had an excellent experience with Alissa. We discussed my medical history and problems. She was very attentive to my care and is a phenomenal care provider. She was rushed. Behind schedule. We have established Dr. Goodwin as our primary physician. We are very very pleased with her and look forward to doing business with her in the future. Dr Goodwin was very kind, understanding, non judge mental and took her time with me to listen and gave me great medical advice and was very patient with the list of medical issues I needed to address. Dr. Goodwin has always been polite & professional. Dr. Goodwin is fantastic. She is very knowledgeable, patient and thorough. She takes time to listen to concerns and addresses them. She doesn't rush in to the exam room and rush out in 3 minutes, she takes the time to find out what's going on. She is the best doctor I've had in years! I was just there for a check-up but felt the tone and understanding of why was great and she answered a wide variety of questions. I did not feel rushed or dumb for asking my questions. I thought she was smart and kind. Dr. Goodwin is the absolute best. She is so invested in our family and making sure that we get the best care that we can. my entirely family sees her and we feel as though we've won the doctor lottery in finding her. She was very friendly and caring but did not prescribe me antibiotics, I got sicker and went to my own PCP who had to give me antibiotics and steroids for breathing.